The Quinalt River valley and rain forest is home to some of the world’s largest trees. Some of them are the biggest trees outside of California where the Coast and Giant Sequoias grow. In this one valley are 6 of the largest trees, either in Washington State or in the whole world for some species. These include the Western Red Cedar, the Sitka Spruce, the Yellow Cedar, the Mountain and Western Hemlocks and the Douglas Fir. In the first picture here you can see the world’s largest spruce tree. It’s a Sitka Spruce, or Picea sitchensis, as the sign tells and is absolutely huge. I tried to get as much of it in the picture as possible but it’s just too tall. It’s located just a short walk from the Ranger Station and the Quinalt Lodge in the heart of the river valley so it’s an easy one to get to and marvel at. The next picture is of the world’s largest Western Red Cedar, Thuja plicata. We didn’t even try to shoot the top of this because the forest was too dense to see it but you can tell it’s a giant from the size of this trunk. It’s so ancient feeling. I’m not sure how old it is but it’s 174 feet tall and has a circumference of 63 feet. It’s on the north side of the lake and took some hard hiking to get to, as it was very wet when we took this shot last year. But it was worth the climb… The shot after that shows a large cedar from the top down. It’s not a record breaker but it’s still large and gives you an idea of how they grow. The next shot is an unusual one and one we never thought we’d see. It’s in a subdivision near the ocean and is a Dougls Fir trunk that is estimated to have been 1000 years old when it was cut down at the turn of the last century. That’s the 20th century btw… so it was cut in the late 1800’s or early 1900’s. They plan to hollow it out and cover over the inside to make it a tree house and a history lesson for the people who see it. It should be amazing to see when it’s done. If you look closely at the left side you can see notches cut into the trunk. This is how they cut down these giants. They cut chunks out and hammered in planks which they stood on to saw thru the trunk many feet in the air as the bole of the tree was too wide to cut otherwise and was useless lumber. There are huge stands of these stumps all over the West in forests that have been logged. It’s am ingenious way to cut them down, tho personally I can’t understand the mind of a person who would dare to cut down an ancient being like this tree was. As I said in my last post I’m against logging old growth forests wherever they are. It’s too late for this one but there are many others that need protection. Next is the trunk of a large Douglas Fir, Pseudotsuga menziesii. Not a record breaker, still the largest one in the world is located in the park near where we hiked. It was too far to make it to it so here are its stats. It’s 302 feet tall and 40 feet around. Huge isn’t the word for it I guess. It’s massive. It’s a tie with one somewhere else I don’t know where, but it may be in British Columbia which also has some huge trees. I took a picture of the trunk close up and then looking up into this tree. The next shot is of the Fir gracing the lawn at the edge of the lake near the Lodge. It shows how a Fir can grow when it’s not surrounded by other trees. Pretty nice, eh? Here are a few of these trees all growing together in one place. In one you can see 4 of these big trees and in the other who can tell? I sure can’t from the picture tho I could at the site. I should have written it down I guess. These show how dense the forest is in the rain forest. Remember that this area gets around 12 Feet of rain a year on average, which means some years they get more! Amazing…. Here’s a large Red Alder, Alnus rubra. Not a giant at all but still quite nice. These cover huge tracts of land in the West and also fix nitrogen in the soil so they improve the soil where they often are one of the first things to come in after a clear cut or fire. Next is a Vine Maple, Acer circinatum, a large one at the base of a large cedar. These are also all over the rain forest and grow sorta like a Japanese maple. I have one I just planted in my garden too. The next is a simple shot of a Shore pine, Pinus contorta, which covers vast areas of the coastline all along the way from Oregon up to Washington and further north to BC. This is in someone’s garden in Moclips but it was a nice specimen I wanted to show you as its covers so much of the forest. The last 4 shots are of trees that some human planted back in the day when the Lodge was first built in 1937 or so. I’m not sure just when they planted these there after that but I assume it was soon so figure these are only 75 years old or so and they are huge trees already. The first is of trunks of a few Coast Redwood that are probably 8 feet across and 0ver 100 feet tall, right out front of the Lodge. There are many more in back. The next is a large specimen of a Cryptomeria japonica elegans, which I also have in my yard. I’ve never seen one this big and was amazed that it actually gets this tall and wide. All the books say so but seeing is believing and it’s different in person. This is in someone’s front yard and I was thrilled to see it as we drove by and made Louie turn around so I could get a shot of it. I’m glad I did as it reminds me of mine as it grows. Finally is something I’m assuming is an Atlas Cedar. A true cedar, Cedrus atlantica, not the Western cedar which is actually an arborvitae, or Thuja. This tree must have been planted here too and it’s probably 80 or 90 feet tall. I’m not 100% certain of my identification but I’m pretty sure that’s what it is. It’s native to the Atlas mountains in N. Africa and elsewhere in the mid east. Related to the Deodar and Lebanese Cedars, all Cedrus species. As I mentioned in my last post we just spent a week at the ocean near the Quinalt Indian Reservation. One day we took ourselves into that forest and to the Lodge there for lunch and to tour the area. The first shot is entering the Reservation tho most of the time we were slightly out of it on Park land. The first few shots are of the lodge. It was built in 1937 starting in early June and finished by late August the same year. Teddy was coming and they had to have suitable accommodations. In 1937 Teddy Roosevelt visited the Olympic Rain Forest and was met by hordes of school children holding signs saying “Please Mr President, we children need your help. Give us our Olympic National Park”. Roosevelt said it was the “most appealingest appeal” he’d ever heard, and in June 1938 he created a 648,000 acre National Park and made it part of the National Park system. It’s now over a million acres. It celebrated its 75th anniversary last year. The lodge is at the southern most tip of the Park at the southern end of Lake Quinalt. There are a couple of shots of the interior of the Lodge, showing the fireplace that takes 4 foot logs and the entrance to the Roosevelt Restaurant. The picture of all the photos shows the construction of the Lodge from start to finish. It’s hard to read of course but you can see the building going up fast and beautifully. The view from the Terrace shows the Lake as you see it from the dining room windows where we ate lunch. It was amazing and we saw a bald eagle perched in the top of the big Fir at the lawns edge. Next we start to go on some walks and first encountered this tree covered with Licorice fern which I have growing in my garden. It does this thing where it grows on trunks of trees all over, even here in Seattle, but this was a fine stand of it. Next is a shot of the edge of the woods looking into the depths of the forest. Then we went on a hike on a Nature Trail and took a lot of shots along the way. Willaby Creek runs under the road here and we can see it as it falls near the bridge and runs under it. It’s a fast flowing stream that gets pretty big in the winter season as it is rushing now. The trail follows its canyon for quite awhile till it turns back to the start of it. There are many fine ferns to see all over. Here are the Deer fern and the Sword fern, two common NW natives that I have in my yard at home. Here they cover the whole area. Quite a sight to see. Once again we look into the deep woods and see as far as we can into them. It’s not easy as these woods are so dense. I’d never want to bushwhack in them, tho I have. It’s too dangerous and very wet. Lots of water everywhere here. It makes for a lush forest and lots of good growth. Here’s a shot of some kind of weird lichen someone put on a stump so it could be seen well. I dunno what it is but it’s beautiful up close like this. Next I show a few nurse logs and stumps. These are decaying trees or stumps that serve as homes for new life. In some cases even big trees start out on these logs and create a new forest that way. It’s fascinating. In the middle of them is a picture of a skunk cabbage patch just starting to grow into its fluorescent yellow. Pretty cool, eh? Next is another picture looking down into the depths of the forest. It’s just so full of life here it’s amazing how it can all fit. But each plant and animal has its role to play and together they all create this incredible ecosystem that ends with a shot of Lake Quinalt from a nice picnic area near the entrance to the Reservation. It’s a large lake and only is used by the Native fisher folk now because of all the troubles with non-native invasive water creatures being brought in by outside anglers and boaters. Now only the Tribe can use the lake for fishing and I think that’s a good thing. It’ll preserve it from the encroachment of more of the usual development that has already happened here. Lots of controversy is brewing out here to keep the Olympics wild, tho some locals want it kept for themselves to log and cut down the forest. You can probably tell where my sympathies lie. I sympathize with the local folks but this is a National, even a World Class, Treasure, and it needs to be protected. I think the Tribe will do a much better job of that and maintaining more of the land will only make more trees safe from the chainsaw. I hope it happens well for all concerned and that some sort of compromise can be worked out to save this forest and keep people’s jobs as well. It’s not am easy task. There are signs all over the area saying to “Stop the Wild Olympics” and let them log it. I personally feel that Old Growth trees should Never be logged, ever again. We won’t have more of them in our lifetimes and even our great grandchildren won’t have them if we don’t save this incredible Sanctuary now. It’s the right thing to do for the generations to come and for the earth itself. I wrote this well over a year ago in my other blog, Naked Nerves, which is about Living with Invisible Illness. Some comments I’ve gotten recently have made me feel that it’s perhaps relevant to post it again here now. 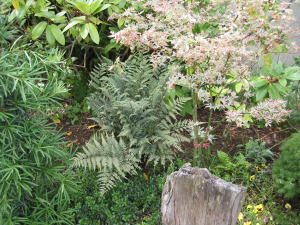 The picture is a Ghost Fern underneath an Ukigumo Japanese maple.